Do you have lots of corn, cucumbers and tomatoes leftover from this years garden harvest or your CSA box? 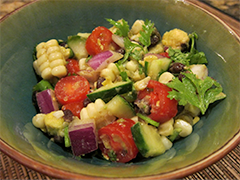 Today’s post features a cool salad using cucumbers and sweet corn with an easy vinaigrette! Here’s a highlight of the health benefits of the cucumber, Cucumis sativus. They contain certain polyphenols called lignans that have been associated with a reduction in risk of cardiovascular disease and cancers such as breast, uterine, ovarian, and prostate cancer. Fresh extracts from cucumbers have both antioxidant and anti-inflammatory properties alongside nutrients like vitamin K, beta-carotene, and manganese (1). Plus, cucumbers are delicious! They have a great cooling ability and are refreshing in practically any situation. Cucumbers are in the plant family called Curcubitaceae, which also includes melons and squashes. Although there are hundreds of different varieties of Cucumis sativus, they are divided into two basic types: slicing and pickling. Slicing cucumbers are the ones we are using in today’s recipe and they are meant to be eaten in their whole food form while pickling ones…well, you can guess what pickling cucumbers are used for. Pour all other ingredients into a large salad bowl. Mix well. Add vinaigrette to large bowl and mix. Serve fresh or keep in a sealed container in the refrigerator for up to five days. This is also great as a dip for corn chips, rice crackers or the like! World’s Healthiest Foods web page about cucumbers. 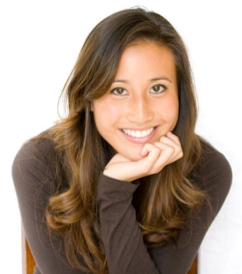 About the author: Christine is a second year naturopathic medical student with a focus on whole foods, physical exercise, and pediatrics. She is from Seattle and received a Bachelor of Science degree in Biology at the University of Washington. Christine was a group fitness instructor in strength training and spinning for nearly three years until she moved to Portland to attend school. She enjoys going to the gym and biking on the weekdays, hiking and climbing on the weekends, and doing meal preparations for the week on Sundays. Having participated in CSAs herself for two years in Seattle, she enjoys being exposed to vegetables she would not have tried otherwise.